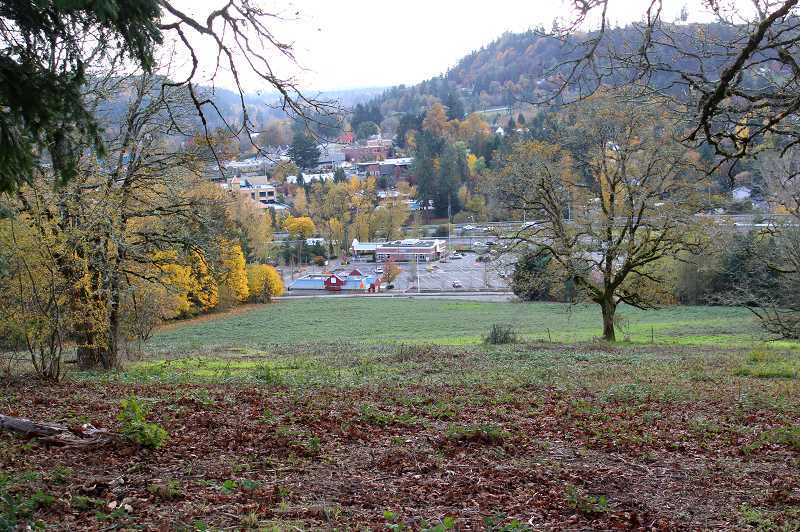 In late 2018, a West Linn City Council discussion about future transportation improvement projects near the 10th Street/Salamo Road area was complicated by a specter that has loomed over that area for years. Residents expressed concerns about how the proposed transportation projects would — or wouldn't — jive with the potential development of an 11-acre site near corner of Tannler Drive and Blankenship. While the property has been mostly dormant since the council rejected an application for mixed-use development in 2015, property owner Jeff Parker requested a code interpretation from the West Linn Planning Commission at a Dec. 12 meeting that would clear up confusion in advance of his submittal of a new application. Specifically, Parker was looking for clarification on what constitutes a "first floor" on a sloped site (where the bottom floor might be significantly smaller than those above it due to topography) as well as the exact meaning of "commercial" use. Both of those code interpretations would have a significant effect on any future development application submitted by Parker. The planning commission's ruling on that code matter left Parker dissatisfied, and he opted to appeal the decision to the City Council in a hearing scheduled for Feb. 11. The planning commission ruled that the first floor should be defined to be as large as "the entire perimeter of the structure at the highest grade" — a departure from the staff recommendation of 50 percent of the perimeter. Regarding the definition of commercial use, the planning commission agreed with the parameters laid out by staff, which were based on OBC code. Parker and his representatives were particularly concerned with the planning commission's first floor definition. "This case is a good example of how important it is to provide the opportunity to request a director's interpretation of the code," Parker's attorney Zoee Lynn Powers wrote in the Jan. 2 appeal letter. "When the code is ambiguous, it is very difficult to give an answer for architects and engineers to rely on in designing a project." Confusion regarding the zoning of the property, and what exactly that entails, is nothing new for Parker and the City Council. In 2015, the council denied Parker's application for a mixed-use development because it did not feel there was enough commercial use on the first floor (as is required on OBC land). In late 2017 and early 2018, Parker floated the idea of a "development agreement") with the City that would have paved the way for the installation of apartments and a fitness center at the same property. Confusion arose when Parker also scheduled a pre-application hearing around the same time for a mixed-use development that would include 216 housing units and 30,500 feet of commercial space on the bottom floor. Ultimately, Parker dropped the development agreement proposal and never submitted an official application for the mixed-use development. The issue receded into the background for much of the year until the Dec. 12 planning commission hearing. Following the commission's ruling, Powers wrote in the appeal that the first floor rules were even more confusing than before. "I believe that planning commission's intent was to ensure that the entire perimeter — that is, 100 percent of one full floor plate — was included in commercial use," Powers wrote. "The issue was confused, however, by a drawing we were using to illustrate the staff's 50 percent interpretation." That drawing showed a building with three floors, all containing two units of the same size. Below those units was a commercial space that dug into the slope and took up about half the space of the main floors. "Because (code) requires that 'multiple-family units' be built 'only above the first floor,' the decision has the paradoxical effect of creating two floors which are the singular 'first floor': one full floorplate ... plus the downhill 50 percent floorplate," Powers wrote. "It is implausible that the drafters of the code intended that the requirement on a sloped site be for 150 percent of a floorplate, where on a flat side it would only be 100 percent of a floorplate." Additionally, Powers said such an arrangement would force commercial spaces to face uphill and away from the main road (Blankenship), which could hinder their success. As part of the appeal, Powers requested that the council change the first floor definition by eliminating a reference to the "highest grade" and referring to it instead as "the lowest story with square footage equal to a story which includes the entire perimeter of the structure." The appeal also asked for further clarification of the definition of a "live-work unit" in the City's Community Development Code (CDC).